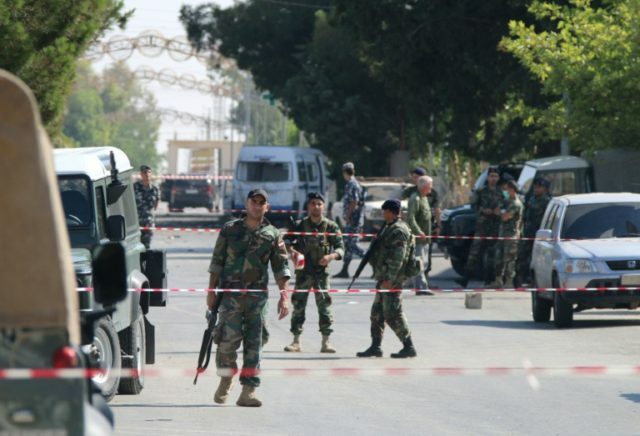 Al-Qaa (Lebanon) (AFP) – A string of suicide bombings early Monday killed at least five people in a Lebanese village near the volatile border with war-ravaged Syria. The attack came just hours after the Islamic State group on Sunday claimed responsibility for a suicide attack that killed seven soldiers on Jordan’s border with Syria. Monday’s deadly attack struck Al-Qaa, a predominantly Christian village nestled in a hilly border area shaken by violence since Syria’s conflict erupted in 2011. At least four suicide blasts hit the village before dawn, a military source told AFP. “The first attacker knocked on one of the homes in the village, but after the resident became suspicious, he blew himself up,” the source said. He said three other suicide attackers detonated their own explosives as people began gathering to treat the wounded. An AFP correspondent in the village said security forces had cordoned off the site of the blasts, which lies on a main road linking the Syrian town of Al-Qusayr across the border to Lebanon’s eastern Bekaa valley. “Al-Qaa is the gateway to the rest of Lebanon, and here we stopped a plan for a much bigger explosion,” said Al-Qaa mayor Bashir Matar. “We chased the fourth attacker and shot at him, and he blew himself up,” Matar said, adding that five villagers had been killed in the attack. He said 15 other people were wounded, including some in critical condition. A statement from Lebanon’s army said at least four soldiers were wounded in the string of attacks, which the country’s national news agency reported took place at 10 minute intervals. Al-Qaa is one of several border posts separating Lebanon and war-torn Syria. Al-Qaa’s residents are mostly Christian, but one district called Masharia Al-Qaa is home to Sunni Muslims. And displaced Syrians fleeing the war next door have set up an informal camp adjacent to the village. The border area has been rocked by clashes, shelling, and suicide attacks since Syria’s conflict erupted in March 2011. But blasts in densely-populated areas in Beirut throughout 2013 and most recently in November have been much deadlier. On November 12, more than 40 people were killed in twin suicide bombings claimed by the Islamic State group in a southern Beirut neighbourhood. IS late Sunday claimed responsibility for a blast earlier this week that left seven Jordanian soldiers dead and 13 others wounded, according to the jihadist-linked news agency Amaq. Lebanon’s army has fought off jihadist factions along the frontier and has sought to clamp down on local cells operating in the area. In August 2014, the army clashed with the IS and Al-Nusra Front, Al-Qaeda’s affiliate in Syria, in the border town of Arsal.